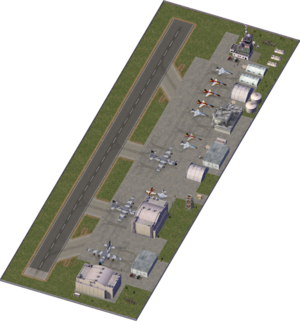 The Air Force Base is an unlockable Civic Trophy Reward Building for SimCity 4 Rush Hour/Deluxe. It was initially released on the Transportation Pack CD-ROM, given to those who preordered SimCity 4 Rush Hour at certain North American retailers. It was eventually released as Plugin Pack 007 on SimCity4.com as part of the free Downloadable version of the Transportation Pack. It provides no services aside from a cap increase and access to the Military Base U-Drive-It vehicles without the overwhelmingly negative effects of the Military Base. Due to the noise generated by the base, it lowers the Mayor Rating of all residents in a 440 tile radius, radiates a 90 point Park effect penalty over a 36 tile radius, but provides a 20 point Landmark effect over a 9 tile radius due to Air Shows. It also significantly bolsters the local Manufacturing Industry, providing a 100,000 I-M Cap increase, more than any other building. The News Ticker fluff entry created on its placement is "Air Force Base Roars Into #city#; Earplug Sales Rise". Combined Residential Population in excess of 15,000 Sims. Citywide Education Quotient greater than 60. The Air Force base is the only known building which can grow on the unimplemented Airport zone without modification, which it is a Stage 3 building for. The Air Force Base was originally supposed to trigger a MySim advisor message for all nearby MySims titled 'Air Force Training Missions Excite, Annoy #Advisor#'. Originally, it was to state their mixed feelings about the new nearby base. The code needed for this to work has been commented out in the LUA script and the file reference itself is also commented out. This building was instrumental in mapping out SimCity 4's DAT file format and the DBPF file format as a whole. The DAT file it came in was the first DBPF file decoded by the community and its building exemplar the first decoded thanks to it being on the Preorder CD. The Air Force Base interferes with Area 5.1, resulting in the two not able to exist in the same city simultaneously. It is unknown if this is intentional. There is evidence that this file contains some late implementations of content originally intended to be included in Rush Hour but cut before the game went Gold. The Air Force Base is the most obvious example since it was released in a playable state, however there are trace files of other unfinished U-Drive-It vehicles like a Paddle Steamer and an improved implementation of the Steam Engine. This page was last modified on 2 August 2016, at 05:35. This page has been accessed 47,170 times.